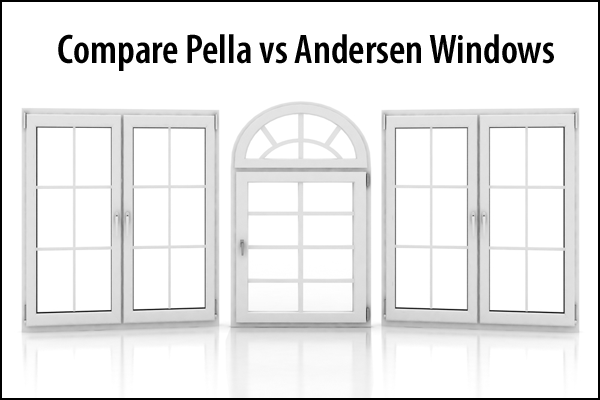 While both brands carry premium windows, Andersen windows are slightly less expensive than Pella windows. Pella offers far more window material choices. Both brands are very well known and carry Energy Star qualified windows. Pella was founded in 1925 based upon a novel idea: a window screen that rolled up and down like a shade. Later, the company invented the tilt-wash, double-hung window - a consumer favorite for the ease it brings to window washing. Today, Pella is the country’s second largest manufacturer of windows, patio doors, entry doors and storm doors. Pella has developed a reputation for high-quality, long-lasting windows. The company offers eight different styles of windows, from traditional casement windows to bay windows. All Pella windows are energy efficient and feature a “low-emissivity” coating to block the sun’s ultraviolet rays. Pella window prices vary based upon the material type, style, level of energy efficiency and finish options. For example, wood windows are going to cost more than vinyl windows. On average, plan on spending about $600 to $1,000 for each Pella window, including the cost of installation. Individual windows begin at around $300 each and run upwards of $2,500. Quality - Pella makes high-quality, well-constructed windows that are designed to last. The windows are sold with a 10-year warranty for non-glass components and a 20-year warranty for glass. Energy efficiency - Pella windows are Energy Star qualified and U.S. Green Building Council LEED qualified. Materials selection - Pella offers a wider array of materials choices than Andersen. Choose from wood, fiberglass, composite or steel. Price - Pella makes premium windows, which come with a premium price tag. The company’s prices are higher than many of its competitors, including Andersen. Color selection - Pella offers fewer color choices than Andersen. Founded in 1903, Andersen has a long history of manufacturing high-quality windows. Today, the company makes more than 6 million windows and doors each year. Most consumers are familiar with the Andersen name, even if they’ve never purchased windows. There are six different types of Andersen windows: awning, casement, double-hung, gliding, picture/fixed and bay. Andersen windows are also highly energy efficient, featuring low-E glass to block the sun’s UV rays. They also feature a tough protective shell that never requires painting. The price of Andersen windows also varies based on the type, style, level of energy efficiency and finish options. On average, plan on spending about $350 to $1,000 for each Andersen window, including the cost of installation. Individual windows begin at nearly $300 each and run upwards of $2,000. Price - Andersen windows are slightly less expensive than Pella windows, although they also have a premium price tag. Quality - Andersen windows are also high-quality and long-lasting. They’re one of the best-known brands in the business. Andersen windows are sold with a limited warranty that can be passed from one homeowner to the next. Energy efficiency - Andersen windows are Energy Star certified and LEED qualified. They also carry the Green Seal stamp of approval. Color selection - Andersen windows are sold in a wider array of color options than Pella windows. Fewer materials options - Most Andersen windows are made of a sturdy composite known as Fibrex, which is made using reclaimed wood fibers.